This tour is designed for those with limited time who would like to gain some insight into the rich tapestry of the cultural heritage of Nepal and especially The Kathmandu Valley.The tour includes visits to all the major sites of interest within the three ancient cities of the valley Kathmandu Patan and Bhaktapur along with visits to Chovar and Daskhinkali and Dulikhel (a holy Hindu pilgrimage site) there is also time to visit the ancient settlements of Bungamati and Kokana during your stay.For those wishing to get close up to the mountains we can include a mountain flight in the cost of your tour.The Kathmandu valley boasts seven World Heritage Sites UNESCO within a radius of 20km. Day 01 : Meeting upon arrival at the Kathmandu International Airport. Transfer to hotel. Refreshment drink and briefing about our tours program. Welcome dinner in the evening at typical Nepali restaurant, Overnight at Hotel. Day 02 : After having breakfast we will lead you to full day sightseeing at Swayambhunath, Pashupatinath, Bouddhanath and Kathmandu Durbar Square and Patan Durbar Square, Overnight at Hotel. Day 03 : Full day sightseeing at Bhaktapur, Changunarayan and Budhanilkantha, Overnight at Hotel. 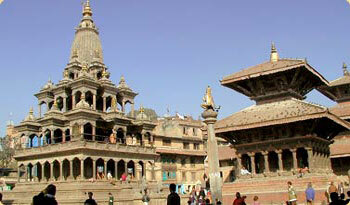 Day 04 : Drive to Daksinkali Temple, Chobhar and Kirtipur for the sightseeing, Overnight at Hotel. Day 05 : Transfer to the airport. Departure on your own destination, Overnight at Hotel.